The phonograph was invented in the 18th century by Thomas Edison, but has remained nearly the same for over a hundred years. 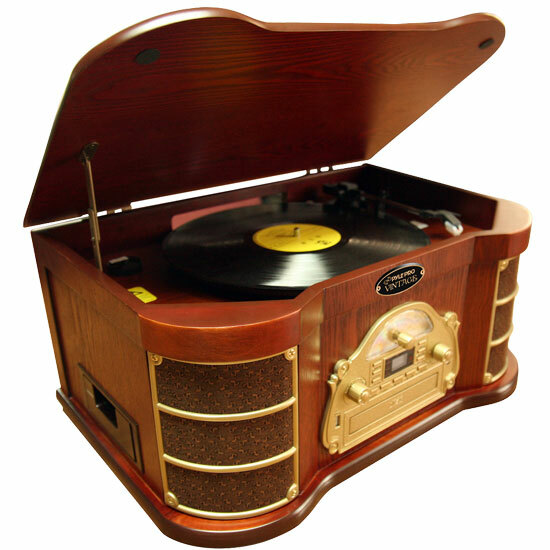 Now you can retain the look of a classic phonograph but have the technology of the 21st century This vintage, authentically wood-crafted turntable is equipped with an AM/FM radio, CD player, cassette deck, aux in jack for your MP3 player, and even an iPod dock for a wealth of playback options. Use the included remote to control your device. The built-in speakers sound great, and you'll be enjoying the old classics and the new hits on this conversation piece in no time. Review : So Far So Good. Review : This is an incredible unit. Whether you are recording from device to device or just listening the transition is simplistic. I Love this thing!!! Review : I have wanted something like this for a very long time and my husband bought this one for me for Christmas! I absolutely love it! Review : Our new Classical Turntable with AM/FM Radio/ CD/ Cassette/ USB Recording & iPod Player Model PTCDS2UI is perfect for our historical home. Review : It's a great turntable for that classic vintage sound and look. The positives for this is the wood finish is beautiful, it's very versatile, and the speakers give off a great sound. Especially with acoustic or live sessions. The only negatives I'm finding are that it doesn't have much adjustment that you can make with it. Therefore if it is running slow you can't adjust it and they weight of the arm and needle is a bit weak causing it to skip unnecessarily. Also the speakers don't work well with sounds that have some bass, often a bit of rattling or distortion occur. Other than that it's still a great record player. Review : Everything on this product works exceptionally well, speakers sound great, very pleased with this purchase. Review : Works well. All components work well. Record drags sometimes but nothing to worry about. Gives that "old record player sound"
Review : I was looking for a "record player" and found this product at BestBuy online. Wonderful to have all the many components(turntable, radio, CD, cassette player and ipod/phone input jack all contained in a wonderful vintage looking player! It has pretty good sound and is not too large. The CD isn't working, but I'm hopeful that the company will resolve this problem with it's warranty. Review : I was trying to find a vintage player for these old 78's and I found this is so much better because I can play my cassettes as well. Plus, I love the way it looks at the fact that it has a wood covering. I have an old radio that no longer works and if you put both side by side, they look as if they both were built around the 1930's. Review : Neat set up. Will be able to enjoy vinyl records once more. Review : We are extremely pleased with this product. My husband has wanted to listen to his records and CDs for years. Review : Great product really enjoying it by playing old records and cds. Review : WE ABSOLUTELY LOVE THIS RECORD PLAYER. CRISP, CLEAR SOUND. ONLY SUGGESTION, WOULD BE TO PUT AV OUT JACK IN THE BACK TO HOOK TO A BIGGER STEREO SYSTEM. OTHER THAN THAT, SOLIDLY BUILT, CLASSIC DESIGN, AND AWESOME PERFORMANCE. ALSO, I LOVE THE OPTIONAL MP3, CD, TAPE PLAYER CONNECTIONS. TOTALLY GROOVY RECORD PLAYER. Review : I have to admit that I didn't like the "look" of the unit online, my husband did and was I pleased that we ordered it in spite of me. It is really beautiful and well made. Setup was relatively nonexistent and the sound is pretty decent considering the price. All in all, I love it AND I can play my LPs again! Review : For the price, one cannot beat the looks, quality and versatility of this all-in-one audio product. Review : A very nice player with multi-function capability. Seems to play everything very nicely. Review : Very nostalgic. Good sound quality and is a fine addition to my living room decor. Review : The sound is fantastic. It's compact so easy to move around but delivers all the contemporary needs for music lovers- digital options plus vinyl options. Plus, it looks cool. Review : VERY PLEASED WITH THE QUALITY OF THE CABINET, THE SOUND AND THE EASE OF USE. Review : We are very pleased with this product. The sound is superb and with all of the features we will never want for a way to play our music. Review : The unit I purchased is simply amazing and I love It!It is the PTCDS2UI which will simply do everything!! It is a USB, turntable, cd am/fm radio and cassette player ,,Wonderful! Review : Love ...good bang for your buck. Review : Wonderful name for a wonderful product - it is wonderful to be able to play a vinyl record again, along with the ability to utilize the system features: CD, Cassette, AM/FM, mp3 -just received as gift - sounds great! Review : The Vintage did a great job downloading my old albums and cassettes to a flash drive. It also had a very nice sound quality. This was a great gift from good friends. Review : I love everything about this product the nostalgic look, the sound quiality and all the options! Received as a gift and I am absolutely happy with it! Review : I purchased this for my husband this Christmas as he really wanted an "old tyme" radio. This has EVERYTHING for everyone in our family. The sound quality is fantastic and the workmanship is great. A very sturdy model. I made this all complete by visiting our local used music store where I found LOTS of 78s from the 30s and 40s - the scratchy sound of these records really adds to the nostalgia...super fun gift...it's been playing all day long. You will NOT be disappointed with this item! Review : Product works great, easy setup - flawless sound! Review : Bought this after finding several boxes of old records in the trash of someone in the neighbor hood. Very befitting that I acquire such a classic vintage looking record player for such very old classical albums. Not disappointed, the look and feel of a phonograph with all the bells and whistles of modern technology to boot. I look forward to using this player for years to come. Review : Nice to hear the records again. Review : I am very happy with sound and quality of this product. Review : I purchased this as a gift for my son and he loves it! The sound quality is great and I love all of the products bells & whistles. Great value for the price! Review : Plays records? Check Pretty to look at? Yup Easy to set up? Open Box. Follow Directions. Yup. Happy with my purchase? Yes. Review : Sounds amazing and is very versatile. IPOD, Tapes, records, mp3 players, usb/flash drives... works with all of these. Review : Great sound and easy use thus far. Review : Lacks bass response otherswise tone quality is good. Review : Received this for Christmas and I absolutely love it. It plays everything. Review : I like the PTCDS2UI, but I also wish I could connect it to my receiver and surround sound system! Review : Great sound for a small unit. Nice to have a working turntable again. Review : Gift from Wife and Kids for Christmas. This has the "Best" analog sound from a modern item. I will definitly be using this everyday. Takes me back to the 1970's listening to all my KISS/Zepplin/ and Alice Cooper records as a kid. Review : I bought this Nostalgic Music System for my husband and he loves it. Matter of fact, this may be the most successful present I have ever bought for him. It has enabled us to reconnect with a large collection of vintage records and brought back treasured memories. The exterior is wonderful to look at and the sound is perfect. PYLE, you have made us very happy. Review : Great sound and many features I'm Very happy, December 7, 2011 By D. Ritchie Amazon Verified Purchase(What's this?) This review is from: Pyle Home PTCDS2UI AM/FM Radio/CD/Cassette/USB Classic Turntable with iPod Dock (Electronics) This is one of the best things I've purchased this year. Looks really cool and made from real wood, nice and solid. I have records from the 1940's and on and this player is awesome, even records that are scratched up play with none or very little crackle and pops. But don't expect your record to sound good if your not using a high quality record cleaner before playing. Everything works great on this player, I read some reviews that did'nt look to good about it, but I have to say to those people, YOUR WRONG if you have anything bad to say about this player. For example, one person complained about a 3 month warranty, well guess what, learn to read buddy, It clearly states on the policy included that it has a 1 year warranty, the 3 month warranty is an extention you recieve for writting a review and letting PYLE now about it... so 13 month warranty sounds pretty good to me. Other reviews I read were all good, So here's my good review. Ok, this player comes with a remote to control the MP3 and USB record and play, you can record records right to a USB thumb drive, how cool and easy to use is this. Sound is awesome, I found this on sale for $159.50 here on Amazon and you just cant compare this to other systems of this style as far as quality or price goes. It does come with an extra needle too. Review : I was pleasantly surprised by the sound quality, and the fact that this record player has so many features! I really wanted to record my grandparents' vinyl collection to digital, and I'm amazed at the USB connection. I can't wait to use my flash drive! The item arrived already set up, and except for a few loose screws on the phonograph turntable, it was all set to go! I am thoroughly impressed with this item, and even though I've never heard of Pyle Audio before, I wanted something not too large that played my IPOD, and burned to USB and CD. I'm really happy with the item thus far, and I like the aesthetic style. It definitely looks definitely than a lot of other similar products out there, and with more features and a cheaper price in this economy, I couldn't be happier! I'm going to recommend this product to everyone I know! I love the "paprika" color wood, and I love the fact that the it's actually wood and not wood particle. The only downside as of right now is that I wish the lid opened more, but I suppose that would compromise the integrity of the product, and possibly damage the phonograph system. Five stars and two thumbs up!